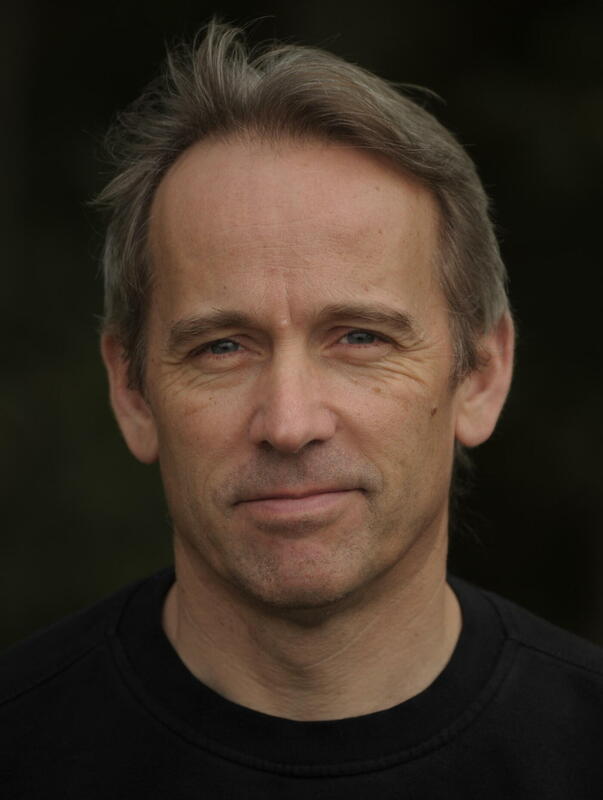 Read An Exclusive Excerpt: 'The Last Dragonslayer,' By Jasper Fforde Jasper Fforde is known to older readers for his Thursday Next literary fantasies. His first young adult novel follows 15-year-old foundling Jennifer Strange, who runs a wizard management agency in a world that's rapidly losing magic — but business is about to pick up. Fifteen-year-old foundling Jennifer Strange has a lot of responsibility. In a world that's rapidly losing its magic, she's the acting director of Kazam Mystical Arts Management, riding herd on a crowd of cranky wizards who've been reduced to doing magical odd jobs to make ends meet. But change is afoot in this charming comic adventure for younger readers: Seers throughout the land have been having powerful visions of the death of the very last dragon at the hands of a destined Dragonslayer and the return of Big Magic. In this scene, we meet Jennifer and her charges as they prepare to use their diminished powers on a home-improvement project. 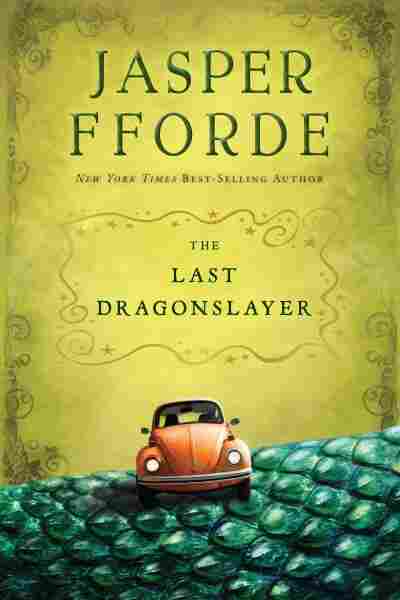 The Last Dragonslayer will be published Oct. 2. Once, I was famous. My face was seen on T-shirts, badges, commemorative mugs, and posters. I made front-page news, appeared on TV, and was even a special guest on The Yogi Baird Daytime TV Show. The Daily Clam called me "The year's most influential teenager," and I was the Mollusc on Sunday's Woman of the Year. Two people tried to kill me, I was threatened with jail, had fifty-eight offers of marriage, and was outlawed by King Snodd IV. All that and more besides, and in less than a week. My name is Jennifer Strange. It looked set to become even hotter by the afternoon, just when the job was becoming more fiddly and needed extra concentration. But the fair weather brought at least one advantage: dry air makes magic work better and fly farther. Moisture has a moderating effect on the mystical arts. No sorcerer worth their sparkle ever did productive work in the rain — which probably accounts for why get­ting showers to start was once considered easy, but get­ting them to stop was nearly impossible. We hadn't been able to afford a company car for years, so the three sorcerers, the beast, and I were packed into my rust-and-orange-but-mostly-rust Volkswagen for the short journey from Hereford to Dinmore. Lady Mawgon had insisted on sitting in the passenger seat because "that's how it will be," which meant that Wiz­ard Moobin and the well-proportioned Full Price were in the back seat, with the Quarkbeast sitting between the two of them and panting in the heat. I was driv­ing, which might have been unusual anywhere but here in the Kingdom of Hereford, which was unique in the Ununited Kingdoms for having driving tests based on maturity, not age. That explained why I'd had a license since I was thirteen, while some were still failing to make the grade at forty. It was lucky I could. Sorcerers are eas­ily distracted, and letting them drive is about as safe as waving around a chain saw at full throttle in a crowded nightclub. Author Jasper Fforde is best known for his Thursday Next series of literary fantasies. The Last Dragonslayer is his first book for younger readers. We had lots to talk about — the job we were driv­ing to, the weather, experimental spells, King Snodd's sometimes eccentric ways. But we didn't. Price, Moobin, and Mawgon, despite being our best sorcerers, didn't really get along. It wasn't anything personal; sorcerers are just like that — temperamental, and apt to break out into petulant posturing that takes time and ener­gy to smooth over. My job of running Kazam Mystical Arts Management was less about spells and enchant­ments, diplomacy and bureaucracy, than about babysit­ting. Working with those versed in the Mystical Arts was sometimes like trying to knit with wet spaghetti: just when you thought you'd gotten somewhere, it all came to pieces in your hands. But I didn't really mind. Were they frustrating? Frequently. Were they boring? Never. "I do wish you wouldn't do that," said Lady Mawgon in an aggrieved tone as she shot a disapproving glance at Full Price. He was changing from a human to a walrus and then back again in slow, measured transformations. The Quarkbeast was staring at him strangely, and with each transformation there wafted an unpleasant smell of fish around the small car. It was good the windows were open. To Lady Mawgon, who in better days had once been sorceress to royalty, transforming within potential view of the public was the mark of the hopelessly ill-bred. "Groof, groof," said Full Price, trying to speak while a walrus, which is never satisfactory. "I'm just tuning up," he added in an indignant fashion, once de-walrussed or re-humaned, depending on which way you looked at it. "Don't tell me you don't need to." Wizard Moobin and I looked at Lady Mawgon, eager to know how she was tuning up. Moobin had prepared for the job by tinkering with the print of the Hereford Daily Eyestrain. He had filled in the crossword in the twenty minutes since we'd left Kazam. Not unusual in itself, since the Eyestrain's crossword is seldom hard, ex­cept that he had used printed letters from elsewhere on the page and dragged them across using the power of his mind alone. The crossword was now complete and more or less correct — but it left an article on Queen Mimosa's patronage of the Troll War Widows Fund looking a little disjointed. "I am not required to answer your question," replied Lady Mawgon haughtily, "and what's more, I detest the term tuning up. It's quazafucating and always has been." "Using the old language makes us sound archaic and out of touch," replied Price. "It makes us sound as we are meant to be," replied Lady Mawgon, "of a noble calling." Of a once noble calling, thought Moobin, inadvertent­ly broadcasting his subconscious on an alpha so low, even I could sense it. Lady Mawgon swiveled in her seat to glare at him. "Keep your thoughts to yourself, young man." Moobin thought something to her but in high alpha, so only she could hear it. I don't know what he thought, but Lady Mawgon said, "Well!" and stared out the side window in an aggrieved fashion. I sighed. This was my life. Of the forty-five sorcerers, movers, soothsayers, shifters, weather-mongers, carpeteers, and other assorted mystical artisans at Kazam, most were fully retired due to infir­mity, insanity, or damage to the vital index fingers, ei­ther through accident or rheumatoid arthritis. Of these forty-five, thirteen were potentially capable of working, but only nine had current licenses — two carpeteers, a pair of pre-cogs, and most important, five sorcerers le­gally empowered to carry out acts of enchantment. Lady Mawgon was certainly the crabbiest and probably the most skilled. As with everyone else at Kazam, her powers had faded dramatically over the past three decades or so, but unlike everyone else, she'd not really come to terms with it. In her defense, she'd had farther to fall than the rest of them, but this wasn't really an excuse. The Sisters Karamazov could also claim once-royal patronage, and they were nice as apricot pie. Mad as a knapsack of on­ions, but pleasant nonetheless. I might have felt sorrier for Mawgon if she weren't so difficult all the time. Her intimidating manner made me feel small and ill at ease, and she rarely if ever missed an opportunity to put me in my place. Since Mr. Zambini's disappearance, she'd gotten worse, not better. "Did we really have to bring the beast?" Full Price asked me. "It jumped in the car when I opened the door." The Quarkbeast yawned, revealing several rows of razor-sharp fangs. Despite his placid nature, the beast's ferocious appearance almost guaranteed that no one ever completely shrugged off the possibility that he might try to take a chunk out of them when they weren't looking. If the Quarkbeast was aware of this, it didn't show. In­deed, he might have been so unaware that he wondered why people always ran away screaming. "I would be failing in my duty as acting manager of Kazam," I said, in an attempt to direct the sorcerers away from grumpiness and more in the direction of teamwork, "if I didn't mention how important this job is. Mr. Zambini always said that Kazam needed to adapt to survive, and if we get this right, we could possibly tap a lucrative market that we badly need." "We all need to be in tune and ready to hit the ground running," I added. "I told Mr. Digby we'd all be finished by six this evening." They didn't argue. I think they knew the score well enough. In silent answer, Lady Mawgon snapped her fin­gers, and the Volkswagen's gearbox, which up until that moment had been making an expensive-sounding rum­bling noise, suddenly fell silent. If Mawgon could replace gearbox bushings while the engine was running, she was tuned enough for all of them. I knocked on the door of a red-brick house at the edge of the village, and a middle-aged man with a ruddy face answered. "Mr. Digby? My name is Jennifer Strange of Ka­zam, acting manager for Mr. Zambini. We spoke on the phone." He looked me up and down. "You seem a bit young to be running an agency." "I'm sixteen," I said in a friendly manner. "In two weeks I'll be sixteen, yes." I thought for a moment. "I'm in my sixteenth year." Mr. Digby narrowed his eyes. "Then shouldn't you be in school or something?" "Indentured servitude," I answered as brightly as I could, trying to sidestep the contempt that most free cit­izens have for people like me. As a foundling, I had been brought up by the Sisterhood, who'd sold me to Kazam four years before. I still had two years of unpaid work be­fore I could even think of applying for the first level that would one day lead me, fourteen tiers of paperwork and bureaucracy later, to freedom. "Indentured or not," replied Mr. Digby, "where's Mr. Zambini?" "He's indisposed at present," I replied, attempting to sound as mature as I could. "I have temporarily as­sumed his responsibilities." "'Temporarily assumed his responsibilities'?" Mr. Digby repeated. He looked at the three sorcerers, who stood waiting at the car. "Why her and not one of you?" "Bureaucracy is for little people," retorted Lady Mawgon in an imperious tone. "I am too busy, and paperwork exacerbates my reced­ing hair issues," said Full Price. "We have complete confidence in Jennifer," added Wizard Moobin, who appreciated what I did perhaps more than most. "Foundlings mature quickly. May we get started?" "Very well," replied Mr. Digby, after a long pause in which he looked at us all in turn with a should I can­cel? sort of look. But he didn't, and eventually went and fetched his hat and coat. "But we agreed you'd be fin­ished by six, yes?" I said that this was so, and he handed me his house keys. After taking a wide berth to avoid the Quarkbeast, he climbed into his car and drove away. It's not a good idea to have civilians around when sorcery is afoot. Even the stoutest incantations carry redundant strands of spell that can cause havoc if allowed to settle on the general public. Nothing serious ever happened; it was mostly rapid nose hair growth, oinking like a pig, blue pee, that sort of stuff. It soon wore off, but it was bad for business. "Right," I said to the sorcerers. "Over to you." They looked at each other, then at the ordinary sub­urban house. "I used to conjure up storms," said Lady Mawgon with a sigh. "So could we all," replied wizard Moobin. None of the sorcerers had rewired a house by spell before, but by reconfiguring the root directory on the core spell language of ARAMAIC, it could be done with relative ease — as long as the three of them pooled their resources. It had been Mr. Zambini's idea to move Kazam into the home improvement market. Charming moles out of gardens, resizing stuff for the self-storage industry, and finding lost things was easy work, but it didn't pay well. Using magic to rewire a house, however, was quite different. Unlike electricians, we didn't need to touch the house in order to do it. No mess, no problems, and all finished in under a day. I stood by my Volkswagen to be near the car radio­phone, the most reliable form of mobile communication we had these days. Any calls to the Kazam office would ring here. I wasn't just Kazam's manager; I was also the receptionist, booking clerk, and taxi service. I had to look after the forty-five sorcerers, deal with the shabby build­ing that housed us all, and fill out the numerous forms that the Magical Powers (amended 1966) Act required when even the tiniest spell was undertaken. I did all this because (1) the Great Zambini couldn't because he was missing, (2) I'd been part of Kazam since I was twelve and knew the Mystical Arts Management business inside out, and (3) no one else wanted to. I looked across to where Wizard Moobin, Lady Maw­gon, and Full Price were still sizing up the house. Sorcery wasn't about mumbling a spell and letting fly — it was more a case of appraising the problem, planning the vari­ous incantations to greatest effect, then letting fly. The three of them were still in the appraising stage, which generally meant a good deal of staring, tea, discussion, argument, more discussion, tea, and more staring. The Youthful Perkins was one of the only young sor­cerers at Kazam and was serving a loose apprenticeship. His particular field of interest was Remote Suggestion, although he wasn't very good at it. He'd once attempted to get us to like him more by sending out a broad Am I cool or what?! suggestion on the wide subalpha, but he mixed it up with the suggestion that he often cheated at Scrabble, and then wondered why everyone stared at him and shook their heads sadly. It had been very amusing until it wore off, but not to Perkins. Because we were close to the same age, we got along fairly well and I kind of liked him. But since this might have been a suggestion generated by him, I had no way of knowing if I truly liked him or not. "Hey, Perkins," I said. "Did you get Patrick off to work in time?" "Just about. But I think he's back on the marzipan again." This was worrying. Patrick of Ludlow was a Mov­er. Although not possessed of the sharpest mind, he was kind and gentle and exceptionally gifted at levitation. He earned a regular wage for Kazam by removing illegally parked cars for the city. It took a lot of effort — he would sleep fourteen hours of twenty-four — and the marzipan echoed back to a darker time in his life that he didn't care to speak of. "The Sisterhood sent round your replacement. What do you want me to do with him?" I'd been wondering when this would happen. The Sisterhood traditionally supplied Kazam with a found­ling every four years, as it took a long time to train someone in the somewhat unique set of skills and mildly elastic regard for reality required for Mystical Arts Management, and the dropout rate was high. Sharon Zoiks had been the fourth, I had been the sixth, and this new one would be the seventh. We didn't talk about the fifth. "Pop him in a taxi and send him up. No, cancel that. It'll be too expensive. Ask Nasil to carpet him up. Usual precautions. Cardboard box?" "Absolutely. By the way, I've got two tickets to see Sir Matt Grifflon live in concert. Do you want to go?" "Right," he said, then mumbled something about how he knew at least twelve people who would literally kill to see singing sensation Sir Matt, and hung up. In truth, I would very much like to see Sir Matt Grif­flon in concert. Aside from being one of King Snodd's favorites, he was a recording star and quite handsome in a lantern-jaw-and-flowing-mane kind of way. But I de­cided I should pass, despite my curiosity about finding out what going on a date was like. Even if Perkins was using some beguiling spell, it was a bad idea to get in­volved with anyone in the Mystical Arts. There is a very good reason why sorcerers are all single. Love and magic are like oil and water — they just don't mix. I stood and watched the three sorcerers stare at the house from every direction, apparently doing nothing. I knew better than to ask them what was going on or how they were doing. a moment's distraction could unravel a spell in a twinkling. Moobin and Price were dressed ca­sually and without any metal, for fear of burns, but Lady Mawgon was in traditional garb. She wore long black crinolines that rustled like leaves when she walked and often sparkled in the darkness. During the kingdom's frequent power cuts, I could always tell when it was she gliding down one of Zambini Towers' endless corridors. Once, in a daring moment, someone had pinned stars and a moon cut from silver foil to her black dress, which made her incandescent with rage. She ranted to Mr. Zambini for almost twenty minutes about how no one was taking their calling seriously, and how could she be expected to work with such infantile nincompoops? Zambini spoke to everyone in turn, but he probably found it as funny as the rest of us. We never discovered who did it, but I reckoned it was Full Price. With little else to do except keep an eye on the three sorcerers, I sat down on a handy garden bench and read Wizard Moobin's newspaper. The text that he had moved around the paper was still out of place, and I frowned. Tuning spells like these were usually temporary, and I would have expected the text to drift back to its origi­nal position. Sorcery was like running a marathon — you needed to pace yourself. Sprint too early and you could find yourself in trouble near the finish line. Moobin must have been feeling confident to tie off the end of the spell so the effect would be permanent. I looked under the car and noted that the gearbox was shiny like new and didn't have a leak. It looked like Lady Mawgon was having a good day too. The Quarkbeast pointed one of his razor-sharp claws toward the east as Prince Nasil streaked past much faster than he should have. He banked steeply, circled the house twice, and came in for a perfect landing right next to us. He liked to carpet standing up like a surfer, much to the disdain of Owen of Rhayder, who sat on his carpet in the more traditional cross-legged position at the rear. Na­sil wore baggy shorts and a Hawaiian shirt, too, which didn't go down well with Lady Mawgon. "Hi, Jenny," said Nasil with a grin. "Delivery for you." He handed me a flight log to sign as the Quarkbeast wandered off. At the front of the carpet was a large Yummy Flakes cereal box, which opened to reveal a tall and gangly lad with curly sandy-colored hair and freckles that danced around a snub nose. He was wearing what were very ob­viously hand-me-down clothes. He stared at me with the air of someone recently displaced and still confused over how they should feel about it. "Hello," I said, holding out a hand. "I'm Jennifer Strange." "They speak well of you back at the orphanage," he replied cautiously, shaking my hand as he climbed from the box. "I'm pleased to meet you. My name's Horton Prawns. Most people call me Tiger." "Can I call you Tiger?" He gave me a shy smile. He would have been twelve, the age I'd been when I joined Kazam. Like me, he would be a foundling brought up by the Lobsterhood, or to give the sisters their official title, the Blessed Ladies of the Lobster. Their convent was in what was once Clifford Castle, not far from the Dragonlands. Tiger held up an envelope. "Mother Zenobia told me to give this to the Great Zambini." "I'm the acting manager," I told him. "You better give it to me." "A foundling is the acting manager of a House of Enchantment?" "You're not the first to be surprised — and I'll wager not the last. The envelope?" But Tiger wasn't so easily swung. "Mother Zenobia told me to hand it only to the Great Zambini." "He disappeared," I replied, "and I don't know when he's coming back." "You'll give the envelope to me." We tussled over the envelope until I plucked it from his fingers and tore it open. It was his declaration of ser­vitude, which was little more than a receipt. I didn't read it, didn't need to. Tiger belonged to Kazam until he was eighteen years old, same as me. "Welcome to Kazam," I said, stuffing the envelope into my bag, "where unimaginable horrors share the day with moments of confusing perplexity and utter random­ness. To call it a madhouse would insult even the mad­dest of madhouses." "Double weird with added weird?" "Pretty much. You'll be fine. Compared to the Sis­terhood, it's almost normal. How is old Zenobia these days?" The convent's mother superior was a craggy old ex-enchantress who was as wrinkled as a walnut and about as resilient. "I'm sorry to report that she's stark staring bonkers," replied Tiger. "Listen," said Prince Nasil, "if you don't need me, I've got a kidney to deliver to Aberystwyth." I thanked Nasil for bringing Tiger over, and he gave us a cheery wave, lifted into a hover, and then sped off to the west. I had yet to break the news to him or Owen that the live organ delivery contract would soon be coming to an end. "Miss Jenny, why did I have to stay hidden in a card­board box for the trip?" "Carpets aren't permitted to take passengers. Na­sil and Owen transport organs for transplant these days — and deliver takeout." "I hope they don't get them mixed up." I smiled. "Not usually. How did you get allocated to Kazam?" "I took a test with five other foundlings," replied Tiger. This wasn't unusual. A half-century ago Mystical Arts Management had been considered a sound ca­reer choice and citizens fought for a place. These days it was servitude only, like agricultural labor, hotels, and fast food joints. Of the twenty or so Houses of Enchantment that had existed twenty years ago, only Kazam in the Kingdom of Hereford and Industrial Magic over in Stroud were still going. The power of magic had been ebbing for centuries and with it, the relevance of sorcer­ers. Once a wizard would have had the ear of a king; now we were rewiring houses and unblocking drains. "The sorcery business grows on you." "Pretty much, but don't talk like that to the others. They were once mighty. You have to respect what they were rather than what they are if you're going to fit in, and you need to. Six years at Kazam can be an eternity with people you don't like. Don't start off on the wrong foot. The enchanters are a quirky bunch, and they can be so annoying you want to beat them with sticks, but you'll get to love them like family — like I do." "Six years. But time passes quickly here. It's the variety." The phone bleeped again. It was Kevin Zipp, one of our pre-cogs, a breed of sorcerer who deals less with the here and now than with the will and if. He had told me he would call me at this time several days ago, but as usual with those able to see a hazy version of the future, he had been uncertain of precisely why. He seemed to know now. "Can you get back to the towers?" I glanced up at the three sorcerers, who were concen­trating hard doing nothing. "Not really. Why?" "A biggie. Full color, stereo, and 3-D. I've not had one of those for years. I need to tell you about it." And the radiophone went dead, just as the Quarkbeast reappeared. "So listen, Tiger — "
He had a look of abject fear and horror: eyes wide and staring, left leg shaking uncontrollably, and a strange strangled noise in his throat. I'd seen this reaction before. "That's the Quarkbeast," I told him. "He may look like an open knife drawer on legs and just one step away from tearing you to shreds, but he's actually a sweetie and rarely, if ever, eats cats. Isn't that so, Quarkbeast?" "He'll not harm a hair on your head," I said, and the Quarkbeast, to show friendly intent, performed his second-best trick: he picked up a concrete garden gnome in his teeth and ground it with his powerful jaws until it was powder. He then blew it into the air as a dust ring and jumped through it. Tiger gave a half smile, and the Quarkbeast wagged his weighted tail, which was sadly a little too close to the Volkswagen and added one more dent to the already badly damaged front fender. Tiger gave a nervous laugh, then reached out to touch the Quarkbeast, who shivered in a contented manner — few people dared stroke a Quarkbeast. I could see there were hundreds of questions going around in Tiger's head, and he really didn't know where to start. "What happened to the Great Zambini?" "Officially it's plain 'Mr. Zambini' these days, now that magic has dropped so much," I told him. "He hasn't carried the accolade 'Great' for over ten years, although we still use it as a mark of respect." "You don't have it for life?" "It's based on power. See the one dressed in black over there?" "The dignified-looking one. Sixty years ago she was Master Sorceress the Lady Mawgon, She-Whom-the­-Winds-Obey. Now she's just plain Lady Mawgon. If the background wizidrical power falls any further, she'll be plain Daphne Mawgon and no different than you or I. Watch and learn." We stood there for a moment. "The fat one looks as though he's playing a harp," said Tiger. "He's the once-venerable Dennis Price," I told him testily, "and you should learn to hold your tongue. Price's nickname is Full. He has a brother named David, but we all call him Half." "Whatever his name, he still looks like he's playing an invisible harp." "We call it harping because the hand movements that precede the firing of a spell look like someone trying to play an invisible harp." "I'd never have guessed. Don't they use wands or something?" "Wands, broomsticks, and pointy hats are for the storybooks." I held up my index fingers. "These are what they use. We used to take out insurance on their fingers in the old days, but we can't afford it now. Can you feel that?" The faint buzz of a spell was in the air: a mild tin­gling sensation, not unlike static electricity. As we watched, Price let fly. There was a crackle in the air, and with a tremor, the entire internal wiring of Mr. Digby's house, complete with all light switches, sockets, and fuse boxes, swung out of the house — a three-dimensional framework of worn wiring, cracked Bakelite, and black­ened cables. It hung in midair over the lawn, rocking slightly. Price had managed to do something in an hour that trained electricians would have taken a week to do, and he hadn't even touched the wallpaper, drunk any tea, or not turned up on tuesday, as electricians do. "Well held, Daphne," said Price. "I'm not holding it," said Lady Mawgon. "I wasn't ready. Moobin?" "Not I," he replied, and they looked around to see who else might be keeping the wiring levitated. And that's when they saw Tiger. "Who's this little twerp?" asked Lady Mawgon as she strode over to us. "The seventh foundling," I explained. "Tiger Prawns. Tiger, this is Full Price, Wizard Moobin, and Lady Maw­gon." Price and Moobin gave him a cheery hello, but Lady Mawgon was less welcoming. "I shall call you F-7 until you prove yourself wor­thy," she remarked imperiously. "Show me your tongue, boy." Tiger, who to my relief was quite able to be polite if required, bowed and stuck out his tongue. Lady Mawgon touched the tip with her little finger and frowned. "It's not him. Mr. Price, I think you've just surged." And the sorcerers fell into one of those very long and complex conversations that enchanters do when they want to discuss the arts. And since it was in Aramaic, Latin, Greek, and English, I could only understand one word in four — to be honest, they probably could too. Yet they did seem to have decided that there had been a surge of wizidrical power. "Tongue in, Tiger," I said. "I have to go back to Zambini Towers," I called to the sorcerers. "Will you be okay here on your own to finish the job?" They said they would, and after nodding to the Quarkbeast, who jumped into the back of my Volkswagen, Tiger and I left them to get on with it.